Are Christmas trees dangerous for cats? And how do you keep them out? Is your Christmas tree actually a danger to your cat? A vet answers. By Peter Hanlon, University of Melbourne. If cats could use the internet, they’d discover that searching “cats” and “Christmas trees” can lead to catastrophising on a scale akin to humans asking Dr Google if they’re going to die from the common cold. “Are Christmas trees poisonous to cats?” “Cats and Christmas trees – a recipe for disaster.” “Can cats and Christmas trees co-exist?” It’s enough to bring on a moggy migraine. 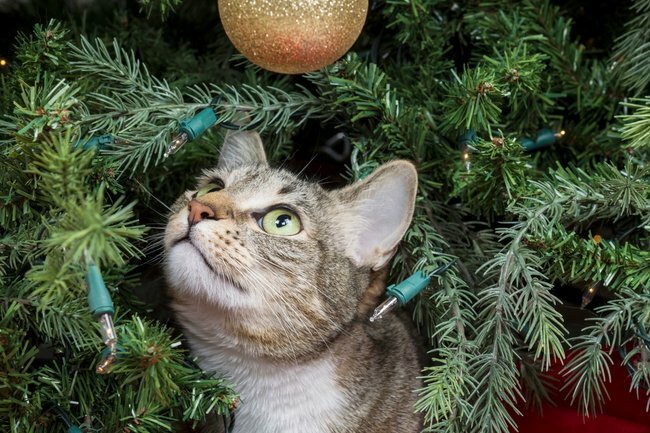 Dr Leonie Richards, Head of General Practice at the University of Melbourne’s U-Vet Veterinary Hospital, says cats and Christmas decorations have always been a recipe for mayhem. But in good news for cat lovers, the main victims she’s come across in this festive frolic have been trees, not cats. While a mischievous puppy is more likely to take a crash-through approach to presents and props, cats are climbers and can launch themselves into branches, bringing the danger of an unstable tree coming down on top of them. “In theory they could knock the tree over and it could pin them down, break a leg or crush a foot, but I’ve never seen it,” Dr Richards says. Not all cats are jolly about Christmas…. How to keep your kitty safe. When it comes to precautions, as ever the best approach is common sense. Laying a carpet of tinfoil on the floor under the tree might be a deterrent, as some cats don’t like the feel of foil underfoot. Double-sided tape on the tree trunk is another helpful online hint, but Dr Richards says this sticky remedy could result in a trip to the vet with a puss whose paw pads have been damaged.